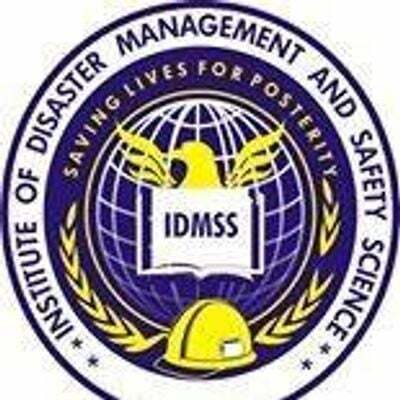 INSTITUTE OF DISASTER MANAGEMENT AND SAFETY SCIENCE ANNOUCES DIRECT PROFESSIONAL MEMBERSHIP BY QUALIFICATION AND EXPERIENCE. FOR DETAILS, PLS CALL 08066788829 OR VISIT www.idmss.com.ng. 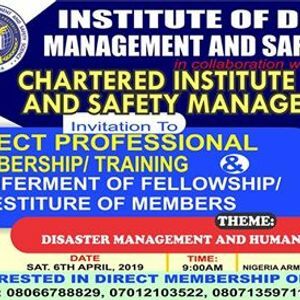 Training/Induction Ceremony with the theme “DISASTER MANAGEMENT and HUMANITARIAN ASSISTANCE” which holds at NIGERIAN ARMY RESOURCE CENTRE ABUJA on Saturday, April 6, 2019 at 9.00 a.m. prompt. Wherever you are in your career, develop your professional focus and ability in emergency preparedness, resilience or response with this innovative professional membership/ training.